These days, finding and recruiting key talent is a complicated dance. The reality is this: 10,000 Baby Boomers are retiring every day and that’s intensifying the skills shortage for most employers. The younger demographic who are replacing these Boomers, namely Generation Y (Millennials) and Generation Z, may not stay long at your company either. While Millennials are often labeled “job-hoppers,” part of the reason they change jobs at a relatively high rate is simply because they’re younger—they’re trying to make more money and find work that makes them happy. Another factor that makes the recruiting dance so technical is the national unemployment rate. At 5.1%, it’s the lowest it has been since 2007. As the U.S. economy continues to recover—and the unemployment rate dips even lower—recruiters will compete harder to acquire qualified talent. Most from the “selfie crowd” have also seen their parents and older relatives struggle through a substantial economic recession. Adversity has certainly influenced these younger job candidates to aspire for more. In other words, when HR interviews a prized recruit, the candidate is likely thinking: “What’s in it for me?” How well does your HR team currently address that thought? As an employer, you’ll need to get your salary numbers right and know where the salary winds are blowing in order to hire and retain your best job candidates. Doing this math is a major part of a winning game plan, but with Millennials and Gen Zers, they’ll also want to feel that working for your company is what’s right for them—that they’ll have interesting work, opportunities to earn their stripes and the necessary support to blaze new trails to both individual and company success. When the dance does focus on compensation, it’s vital to take it step-by-step—and carefully. Consider this: While an employer might offer an attractive salary to get a potential employee to sign the dotted line, it’s wise to take a long view of the implications of any proposed deal. For example, an unfounded $5,000 increase in yearly compensation could potentially add up to several hundred thousand dollars in extra compensation over the course of an entire career, according to one study. The bottom line is that salary is an important factor in attracting the next batch of fresh talent. Studies show that for candidates, compensation is consistently one of the top considerations when evaluating a job offer. Your team should be equipped with the latest salary data, so that you offer the right pay to the right talent. 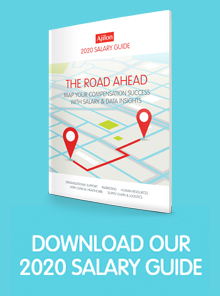 To make sure your salary figures are on track to acquire the talent you need, get our Salary Guide.